How Does Verdigris Detect Energy Anomalies for Your Building? A deep dive into the algorithm that drives your energy alerts. Figure 1. Energy anomaly detection email. How exactly do we detect these anomalies? Our data scientists have built models that learn from and make predictions based on your building's historical data. By looking at the past 3 months of historical energy usage for every circuit in your building, the model constructs an expected region of energy usage with a 95% degree of confidence. We only alert our customers if energy usage falls outside of this expected region. This alert is issued when actual energy consumption deviates beyond the expected area. We are 95% confident that this behavior cannot be explained by random chance. Our models programmatically check every 12 hours for energy anomalies that may impact the cost of your building operation. We track whether or not your building has had an anomaly in the past month, which anomalous activities are ongoing, and which ones have ended. In addition, our models are normalized for weather so your chillers won't set off an energy change alert simply because of a hot day. We also account for weekend versus weekday energy patterns. When an anomaly is detected, we share the most problematic breakers, their contribution to building costs, and a link out to our Insights Dashboard so that you can take a closer look at the individual breaker's behavior and take action to address the energy change. Figure 2. 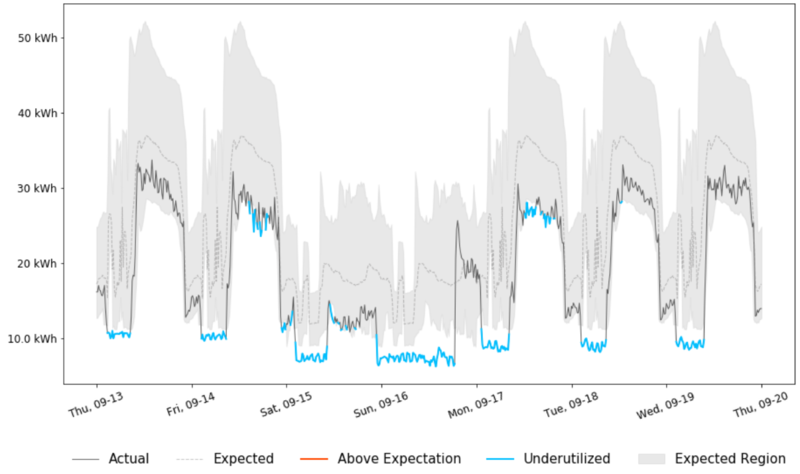 Visualization of actual versus expected energy usage, including any areas performing above expectation or underutilized. Table 1. Top contributing breakers for a building with anomalous activity. The visualization in your energy alert email (Fig. 2 ) is based only on problematic breakers contributing negatively to building operation costs. It does not represent the building load profile. The grey band in Figure 2 represents the range of expected energy usage of those breakers with 95% confidence. The wider the band, the greater the variability of energy usage from the breakers. A black line represents actual energy consumption and normally stays within the grey band. The light grey dashed line represents the expected mean. Red lines depict the energy usage when it exceeds the confidence interval. Whereas blue lines highlight the energy usage when it dips below expectations. If you receive an alert, we recommend reviewing the checklist as possible causes and looking into the energy usage details of the problematic breaker.